Fashion is such an art. Deciding what to wear each day could easily be compared to a highly important equation. You’ve got function combining with style, daily attitude and trends, not to mention the external factors like weather and occasion that come into play. No wonder picking out our clothes each morning is such a major decision. At least for me it is. Thank goodness we have magazines, blogs, celeb style and Pinterest to inspire us. They’re like our rulebooks… But sometimes it’s good to break the rules. It’s a bit like being in a room with a big red button that says don’t push. What do you want to do? Push it of course. Thankfully breaking these fashion rules probably won’t have dire consequences [although I can’t say the same for any red buttons]. Not so. In fact this dark colour combo is totally on trend for the new season so there’s no need to segregate your two most staple wardrobe shades. The trick is to keep the look simple; don’t overcomplicate it with too many details. Stick to those two shades or add in an element of white to tie it together. Again wrong, totally wrong in fact. 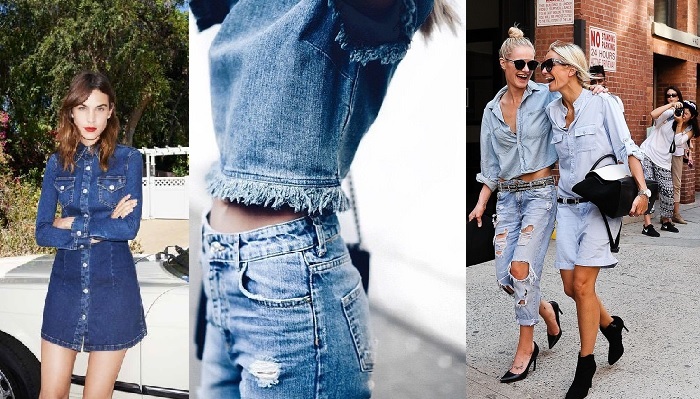 If all the celebs embracing double denim and looking hot while doing it haven’t convinced you then I don’t know what will. You can either pair your washes to match or go for alternate shades. Either way, hot. I’ve always been one to break this rule. I just love my white jeans too much. Sure it’s probably not the greatest shade to wear on a wet rainy day, but if the weather’s just cold and grey then I say go for it. 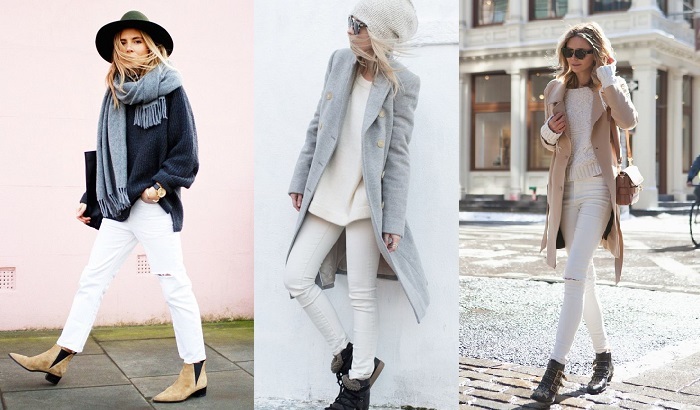 The trick is to make your whites look cosy, not summery. Try tactile layers, a chunky knit, touches of faux fur and some staple accessories. Hello, have they heard of ‘60s style? The mini skirt and the knee high boot has to be one of the most iconic pairings from this fashion era. I will admit there’s definitely a trick to making this pairing look chic though; always go for oversized shapes and loose fits on top. Steer clear of bodycon fits with the tall boots because it can look a little trampy. Wrong. What better time to wear sequins than at night? Sure you don’t want to go out looking like a tacky disco ball but there are chic, understated ways to wear them. Try a dusting on your party dress, an embellished jacket or a jewelled top for Saturday night’s party. A lesser known Greek Island, Naxos conveniently lies between tourist hotspots Mykonos and Santorini, so it’s certainly worthy of a stop along the way. Home to arguably the friendliest people in Europe, Naxos also boasts some truly picturesque beaches; just outside the main town, Agios Prokopios’s crystal waters easily rival those of the Maldives. With ancient ruins and the highest peak in the Greek Cyclades that was believed to be the birthplace of Zeus, there’s no doubt this island has plenty on offer. If you’re travelling through France then a stop in Lyon is simply a must. This historic little town once known for producing silk is now regarded as the centre of gastronomy in France. Lying on the banks of both the Rhône and Saône Rivers, Lyon has plenty to offer its visitors. From the panoramic views atop Fourvière Hill to the majestic Parc de la Tête d’Or (if it’s named after a golden head you know it’s going to be good) this city oozes charm and character. If you’re travelling in the lead-up to Christmas then the little town of Bruges is not to be missed. With a picturesque nature that seems straight out of a story book, this Belgian village really comes alive in December. Cobblestoned squares and laneways are filled with Christmas markets, an ice-rink appears and twinkling lights adorn the medieval buildings. Home to world class frites (fries) and exceptional waffles, you’re certain to enjoy some wonderful food too. Get a taste of Eastern Europe with a trip to Budapest. This often-forgotten city is brimming with history and iconic architecture. Often called one of the most beautiful cities in Europe, an evening cruise down the Danube River to take in the lights of the city is essential. With an extreme climate that swings from sweltering summers to freezing winters, it’s a good idea to visit in autumn or spring. While you’re there make sure you try the local cuisine, take a trip to the famous thermal baths and don’t miss the panoramic view of the city from the Fisherman’s Bastion. If you’re around Amsterdam in the springtime then a visit to the nearby Keukenhof Gardens is sure to be one of the best travel decisions you’ll make. The second largest flower garden in the world, Keukenhof is open each year from March to May with a stunning 7 million hand-planted flowers on display. From tulips to daffodils, hyacinths and lilies – this place is literally a flower-lovers paradise. The gardens also provide a good dose of Dutch culture thanks to its giant windmill and traditional food stalls. Barbican is an interesting little pocket of London; positively buzzing Monday - Friday with handsome fellows in suits, pubs for after-work drinks and skyscrapers housing much of the financial industry, yet it turns into a bit of a ghost town on weekends. However, that doesn't mean it should be forgotten. My beautiful Italian friend joined me which seemed highly appropriate as she's obviously an expert, not to mention she ordered for us, sounding so exotic as she spoke to the waitress in Italian. It's a language I really want to learn, particularly considering my grandfather was Italian. As she told me "enoteca" actually means a place specialising in wine. You can see that it's definitely true here. There are hundreds of bottles lining all the walls. We went for a Gewürztraminer from her region in Northern Italy. I first tried this kind of wine on a wine tour in New Zealand. It's really an intriguing flavour that doesn't taste like anything else. Almost sweet but yet not. It's mellow with a slight tang. Try it! We ordered an assortment of dishes to share. All were delightful. From bread, cheeses and meats to tuna carpaccio with figs and a pear salad. Also, I'm now an aficionado at putting honey on my parmesan; it's the Italian way. Try it, it's incredible. We also had the day's special; home made pasta with truffles. It was beautiful. You really can't beat home made pasta. It’s definitely that time of year where one needs to shift from a summer wardrobe to an autumn one. Already I’ve felt the need to stock up on the essentials like jeans, knitwear and ankle boots. My most coveted new season purchase? This robe coat. It’s everything I’ve been lusting after. If it came in black I’d also buy that one in a second. It’s so cosy with a wrap-style that looks equally stylish when open. The wool-blend is so lush and I can’t get enough of the oatmeal shade. Last weekend when the wind whipped up I took it for a spin around London. I think it fits in perfectly don’t you? Like any day in London, the heavens decided to open at one point but we just worked with the rain and embraced it. After all you can’t beat that view. This vintage black coat has gotta be my close second favourite. Particularly when adorned with a gorgeous little Chanel brooch. So, farewell summer, it was nice to know you. I’m headed for grey skies, wind, rain and maybe even a smattering of snow… But at least I’ll do it in style. What’s your ultimate new season purchase? Share your comments with me on Instagram, Facebook or Twitter. Photos by Krissie and @curioussophia. Friday night in London and I found myself in Covent Garden with a cheeky little invite to London's favourite Asian cookery school; School of Wok, for a supper club. For those of you non-city-dwellers who may not have been to a Supper Club before, allow me to elaborate. It's an evening where like-minded foodies get together to share a table and some food, while the chef pops in and out to discuss the meals with you. I guess you could say it's like a homey restaurant. You know I love food and cooking (probably in equal measures) so it seemed like the perfect way to spend my evening. Dinner kicked off at 7pm so we arrived early and took a spin around Covent Garden Square to see the Heartbeat balloon art installation beforehand. All 100,000 of them. It's really beautiful, so definitely pop down to see it before it finishes at the end of the month. By then our tummies were grumbling so we strolled back through the streets towards dinner. Now can we all just take a moment to do a collective "ooh" and "aah" for my new Chanel Boy Bag. Two years of lusting after one and I finally took the plunge. Honestly I'm totally in love. Can you tell? I can't stop looking at it. Ok fashion-moment over. Back to the important stuff. The food. Our chef Jeremy Pang welcomed us with real warmth explaining he loves these evenings as much as us because it's an opportunity for the chefs to "cook whatever they want!". We popped some champagne, got to know our table comrades and before long our appetiser had arrived. A little nibble of street food-style spring rolls to get us excited for more. Next up were Korean-style marinated beef skewers. Unfortunately no picture of this one, sorry, we were all so excited to dig in. I can however guarantee that they were fabulously tender. A quick chat to Jeremy in the kitchen and I learnt his secret; they're marinated in pear overnight which contains an enzyme that tenderises. By now we'd popped some wine and were happily engrossed in conversion when the next two courses showed up. A thai style warm pork mince salad and a tempura aubergine chilli tomato curry both served with coconut rice [of course!] and a song tam salad. Can I just say, yum! These were honestly so good, particularly the tempura aubergine. I think I need to poach Jeremy to cook for me at home. Just when we thought we couldn't fit in another bite, dessert arrived. Black sesame balls and chocolate ice-cream. The perfect way to finish a feast. I've got to say it was such a fantastic evening. Next time you're thinking of going out to dinner I would highly recommend a supper club. It's a great alternative to the usual meal with friends in that it's got a great social feeling and the food really is first class. Book your own visit to School of Wok here. This post was sponsored by School of Wok. Thank you for having us. This is especially important if you haven’t travelled solo before. Growing up as an only child I’ve always really enjoyed my own company but if you’re not used to it then it might be a bit overwhelming, especially in a foreign place. 2-3 days is the perfect duration for a solo trip, most cities can easily be explored in that time and you’ll be able to pack your days full of adventuring without having too much downtime if you are feeling lonely [but I bet you won’t be!]. On my solo trips I like to take with me a rough itinerary and city map that has points of interest marked. That way if you’re unsure what to do you can refer to the things you’ve already researched! I find the best way to travel is to be busy, sure if you’re on a beach vacation it’s nice to sit back with a book, but a city break to me is about getting around town and seeing it all. Before I go I always check out the top attractions of the city in online forums and get an idea of some of the local hotspots for eating. Now this is just my opinion but when I travel, and especially when I travel alone, it’s really important to me to stay somewhere nice. I usually aim for a 4 star hotel (you can always find amazing deals on Expedia!) where I feel comfortable, safe, it’s a good location and there are good facilities. It just makes the whole thing seem homier. And do it on the first day. When you arrive it’s normal to have a sense of gosh what first!? That’s why a walking tour makes a great option. You’ll be able to meet some people, chat to someone who knows about the city, learn some history and get the lay of the land. Meal times can be awkward when you’re alone but if you pick the right place with a bit going on around you then you’ve got the perfect distraction: people watching! There’s nothing I love more than eating a meal and watching the world go by; who’s at the tables around you, imagining what their life story is, what’s happening out on the street, the fashion, the language, the comings and goings... Don’t feel insecure about sitting alone, I bet the people around you wish they had the guts to do it. Like all good things in life do!… Honestly the more you travel alone the savvier you become, not to mention how much you learn about yourself. It’s really liberating to arrive in a city you’ve never been to before and know that the experience you have is all up to you. Go with a positive mind and a lust for adventure and you’re set for a great time. I would honestly go so far as to say that travelling alone is almost my preference now! It’s really nice to be able to work to your own schedule and go where you please. Off course if you have a friend who is perfect to travel with then that’s great too! But like I said, if you want to go somewhere, don’t put it off just because you don’t want to go alone. Independence is key, embrace it, book the ticket and just go! You’ll have a ball, I promise you will.